Back Cover: Castin has been an outcast all his life. Spending the better part of forty years wandering, the half-elf, half human has been unable to achieve acceptance, mostly due to his ability to manipulate water and earth. But when a vision leads him to an encounter with a woman from Earth, he realizes his druidic powers may not be a curse after all. Perhaps there is a place for Castin in Arconia, if he can live long enough to discover it. Back Cover: Two years after escaping a fiery car crash by slipping through a portal into the mystical world of Arconia, Katrina suddenly finds herself back on earth -- awakening, or so it seems, from a long, deep coma. What Happened? Was her magical experience in Arconia--learning to fight, earning the trust of others, and falling in love-really just a dream? Or is her appearance on Earth the result of something more sinister? Now Katrina finds herself at the center of a multi-dimensional manhunt, full of subterfuge and guile. From Arconia, Katrina's lover Castin and her father Drestin will embark on a dangerous journey to Earth, where Castin must learn to trust others and draw on long-dormant skills from his elven upbringing. Meanwhile, a powerful bounty hunter named Cypris is assigned the task of tracking down the evil sorceress responsible for Katrina's disappearance--with just a young druid apprentice at his side and a newborn son in tow. And Katrina must discover her mysterious past--and past love-all over again. 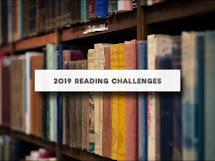 But none of them are prepared for the challenges that lie ahead. When R.L. 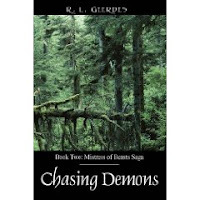 Geerdes asked if I would be interested in reviewing "Chasing Demons" I jumped at the chance to review the new fantasy novel. 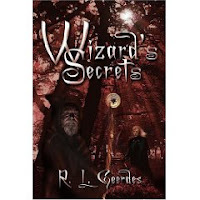 I decided to buy and read "Wizard's Secrets" first which is book one in the saga. When I accepted Ms. Geerdes request, I happened to mention I wanted to read the first book and she kindly sent me both books. I'm glad I read book one first because it gave an excellent introduction to the characters who were in book two. Yes, you can read Chasing Demons as a standalone, but I would suggest reading both in order to better understand the characters. The books are well written and the story interesting. In book one Katrina awakens after a car accident to find herself in another place and time, being tended by a healer who looks like an insectisoid and discovers she can communicate with animals. She finds herself in a battle between good and evil and along the way discovers who her father really is and falls in love. In Book two, an evil sorceress whisks Katrina back to earth and she isn't sure if everything that had happened in the land of Arconia was a dream while she was in a coma. The fiancee who she thought had been killed in the accident with her is very much alive. But when she starts to remember and believe that Arconia was real, he shuts her away in a mental hospital. Meanwhile Castin and her father, Drestin go to Earth and search for her to bring her back to Arconia. Even on Earth, there are magical influences at work. I thoroughly enjoyed both stories. Thank you to R.L. Geerdes for sending me both books. "When I first picked up Chasing Demons, I was looking for a fun fantasy read; something with plenty of action, a little romance (not too steamy please), and certainly nothing too serious. After finishing the book, I am pleased to report that it was just what I was hoping for." "I found “Chasing Demon’s” impossible to put down. I was intrigued by the premise immediately. (I mean, what is reality anyway?)" A brilliant second novel in the Mistress of Beasts Saga. Fast-paced and enjoyable it asks the question “what happens when a magical world and Earth collide?”. An enchanting tale." Thank you for the kind words! I appreciate your willingness to write a critique. I know it must take a lot of time! Excerpts of my books are available on my website - www.rlgeerdes.com.